After spending so much time with your students, it’s hard to say goodbye to them. It's not one of the student teaching difficulties you've prepared for. One great way to do this is through a goodbye letter. 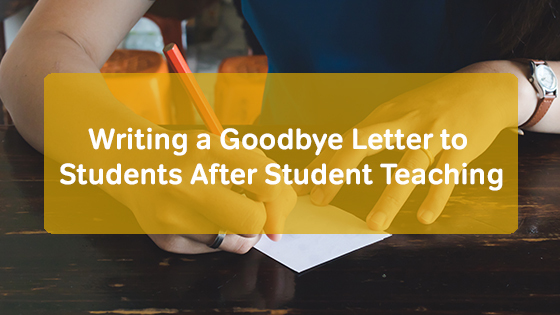 As you sit down to write your goodbye letter to students, here are a few things to consider. What made your student teaching experience so memorable? Your students! Let them know how much you appreciated what they did to make your experience so great. How did they help you improve as a teacher? How did they change how you plan to teach in the future? What did you learn from them? Include these things in your letter to let your students know how much they impacted you for the better. Saying goodbye is hard, and your students are going to miss you. However, try to stay positive. Encourage your students to continue to improve, work hard, and do their best. When you leave, you’ll be handing the students back to your cooperating teacher. Try to make that transition as smooth as possible. Your cooperating teacher will appreciate it! Along with your letter, you could include a small present. It doesn’t have to be anything big or fancy, such as candy or a pencil. You could also make a treat or personalized bookmarks for the students. If you’re going to bring something edible, don’t forget to consider food allergies and dietary restrictions. You don’t want to leave anyone out or make anyone sick. If you have any questions about what to bring, ask your mentor teacher. He or she should have a list of food allergies to provide you. Consider writing personalized messages to every student. Show how much you care about each one of them with a message just for them. Talk about things that you discussed together, areas that the student improved, and more. You don’t have to write a novel for each student, but a quick line or 2 would be a great way to say goodbye to students individually. I hate saying goodbyes. They leave me a teary-eyed mess. For me, a letter is the best way to express what I’m thinking and feeling. When writing to students, I can recall inside jokes that we had during the semester and let students know how much I care about them. What would you include in a goodbye letter to students? Share your ideas below.